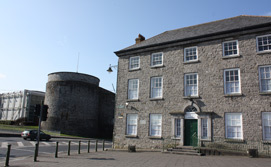 Discover the oldest parts of Limerick City in context with the contemporary environment. The tour commences at the Bishops’ Palace, the headquarters of Limerick Civic Trust. A qualified guide will then take you through the medieval quarter. 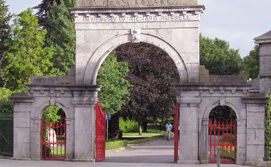 Landmarks include The Bard of Thomond Monument, King John’s Castle, The Toll House, St. Munchin’s Church, Villiers Alms House, The Bishops’ Palace and The Treaty Stone. This tour identifies tree, shrub and flower varieties in a tranquil setting. The many historical monuments within the park are also explored. Focusing on the intriguing history and work of the Freemasons, visitors will be allowed entry to the building where existing artifacts and practices are explained. Price includes entry to the Freemason Museum. As places are limited early booking is advised. Tours are held daily during the summer time at 11am and 2pm, Monday to Friday. Tours are delivered in spoken English. Our tour guides welcome and accommodate verbal translators, sign-translators etc, but this should be stated with advance bookings if time-pressure is an issue. Full-day tours, evening tours and weekend tours all are available, and details are available on request with appropriate notice. Prices will vary for these on an individual basis. We can design tours to suit the needs of any sized group, including bespoke tours for a particular period of history, theme (ghost tours) etc. As places are limited early booking is advised. Group Rates are available. Please contact us for details of discounts offered to groups. 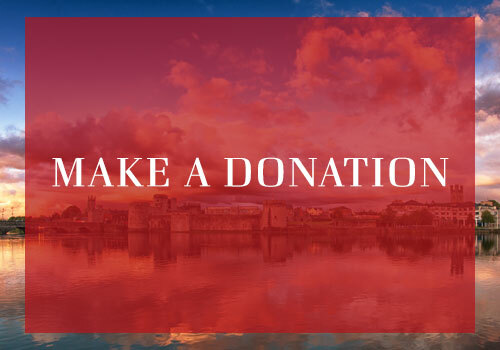 Tours are free for all full members of Limerick Civic Trust. Tours run for approximately 45 minutes – 2 hours. All of the tour formats are walking tours of the Medieval and protected part of the city. As such, wheelchair/disability/special needs access cannot usually be provided. We are happy to design a bespoke tour to suit any such groups, given adequate notice. The 17th century Bishop’s Palace feat. The Carroll Collection: Military historical artefacts and information regarding a Limerick family from the 18th century to the modern day. St Munchin’s church and graveyard – 5th century to the modern day. Villier’s Alms Houses – 19th century. Thomond Bridge (and toll-house) – 10thcentury to modern day. The Treaty Stone & general history of the 17th century sieges and wars in the city. General history of Limerick on the Shannon from 9th century to the modern day. Overview of King John’s Castle – 12th century to the modern day. 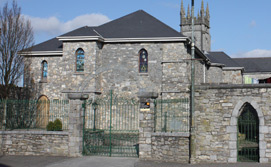 Overview of the story of St Mary’s Cathedral – 11th century to the modern day. Plenty more depending on time available, weather, particular group interest. The Limerick Civic Trust is happy to help arrange expertly-guided tours as additional extras to our own walking tours. NB: These will extend the duration of the tour and may necessitate extra cost. All interested parties will be accommodated where possible, please contact us for extra info.